Location, Location, Location! Our 6 bedroom 6 1/2 bath house is located in a great cove on the 19 MM and is minutes from the Outlet Mall, Movie Theatres, Panera Bread and On The Rise Bakery. This house is perfect for multi-family vacations, family reunions or corporate retreats. It has a private swimming pool with diving board and slide. The private boat dock has a 14x40 boat slip for your use as well as 2 wave runner slips. Additionally, there is a paddle boat and kayak for your recreational enjoyment. The large screened in porch is perfect for outdoor meals or just taking in the view. The outdoor fire pit is a perfect spot for hotdog and marshmallow roasting. The gourmet kitchen is huge with stainless steel appliances, 2 refrigerators, 2 sinks, a wine refrigerator and granite counter tops. The spacious family room has beamed vaulted ceilings with the most breathtaking view of the lake. It has a two story, 3 sided wood burning fireplace for cozy winter fires. Movies can be enjoyed on the 50' plasma high def. TV in the family room or on the flat screen plasma high def. TV in the master bedroom. The spacious laundry room has 2 sets of washers and dryers for your convenience. There is a shower room and dressing room off of the pool entrance for easy clean up after swimming. The master bedroom has a queen bed and spacious bathroom. The 2nd bedroom has a queen bed plus a twin bed The third bedroom has a bunk beds and 2 twin beds. These bedrooms share a jack and jill bathroom. The 4th bedroom has a queen bed and a twin and its own bathroom. The 5th and 6th bedrooms have queen beds and share the hall bathroom. The lower level is finished with a half bathroom, ping pong table, game table, pool table, sectional sofa and large flat screen TV, and lots of extra room for sleeping bags or pads. The cove is perfect for water sports and swimming. The level yard makes horseshoes and washers a must. There is plenty of parking in area in front of the garage as well as on the large driveway. The driveway also has a great basketball hoop for pick up games. If you like the feel of Big Cedar Lodge, you'll love our beautiful, family vacation home! For the families that need additional space, we also have a 3 bedroom, 2 bath guest house with its own private dock next door that is also available for rent as well. We also have three 7 bedroom homes with private pools and private docks directly next door if more space is needed. We live in Columbia,MO., and spend most of our leisure time at the lake. We find the lake has so much to offer for the entire family. The location of our vacation home is right in the middle of all of the activities at the lake including restaurants, outlet mall, movie theater, golf courses, and the hospital. We are less than 5 minutes from almost everything we like to do. 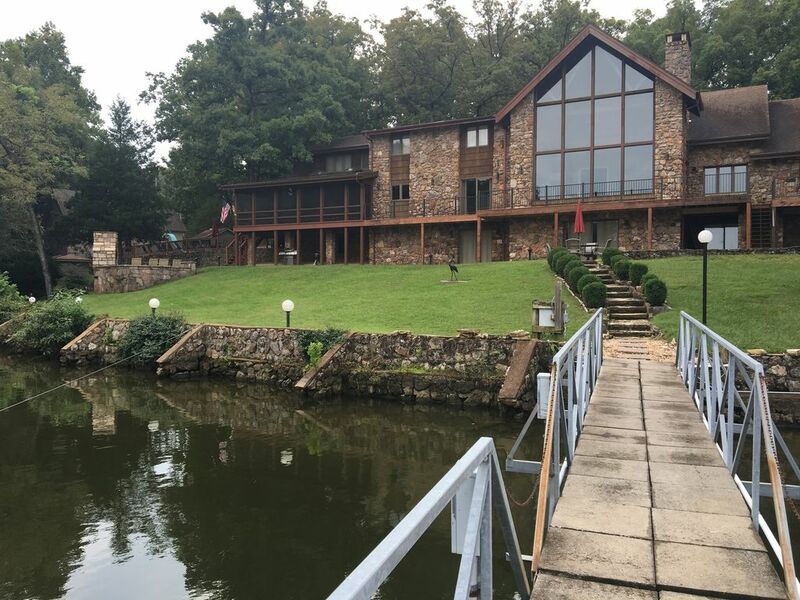 Our home is located in a quiet cove so the kids can enjoy the lake. However, the view of the main channel is one of the best at the lake. The yard is spacious and fairly level so the entire family can enjoy being outside. Our experience was fantastic. Owner was very friendly and easy to work with. Very clean place with new appliances and plenty of space to relax with friends. The house had plenty of things to do (pool table, ping pong, etc.). The only thing that kept it from being a 5-star recommendation was the shower pressure which could have been better. Highly recommend! The owner and caretaker were very accommodating. Nice property and very nice for a large family reunion. Can't say enough about the lodge. It isn't very often when 5 kids under 18 rarely touch their phones! Between the pool, fishing, kayaking, billiards, ping pong, roasting hot dogs, and making smores; there was no time for electronics. Not even the PS4's they brought. Brian made sure we had everything we needed. Dishwasher had a glitch and he was there in 5 minutes. Beautiful view of the lake and nestled in a private cove. We had 9 people in the house with PLENTY of room to spare. Just an awesome vacation at an awesome property. We use VRBO almost everywhere we travel. This property stands heads and shoulders above any place we have stayed. Fantastic house with close proximity to multiple great golf courses, restaurants, shopping and more. Very nice house. We had 15 people staying there and there was plenty of room and ameneties so that everyone could find a quiet space. The dock was large enough so some people could fish while some could jump and swim, nice pool, fun basement with pool and ping pong. We really liked it and will rent it again if we come back to this lake.